This Lutron Maestro ceiling paddle fan control helps you transform the room around you and create a whole new level of comfort. As you enter the room, this control will allow you to change the fan speed with the touch of a button, eliminating inconvenient pull chains. Control up to four ceiling paddle fans from a single Maestro fan control. 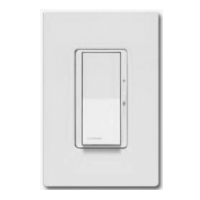 This fan control features 7 quiet speeds for maximum comfort and versatility in any room. Maestro ceiling paddle fan controls work with virtually all existing wiring. The color is white. In multi-fan applications, you will need to purchase the Lutron Canopy Module. To control the ceiling paddle fan(s) from multiple locations, purchase one Ceiling Paddle Fan Control, and a companion switch for each additional location.